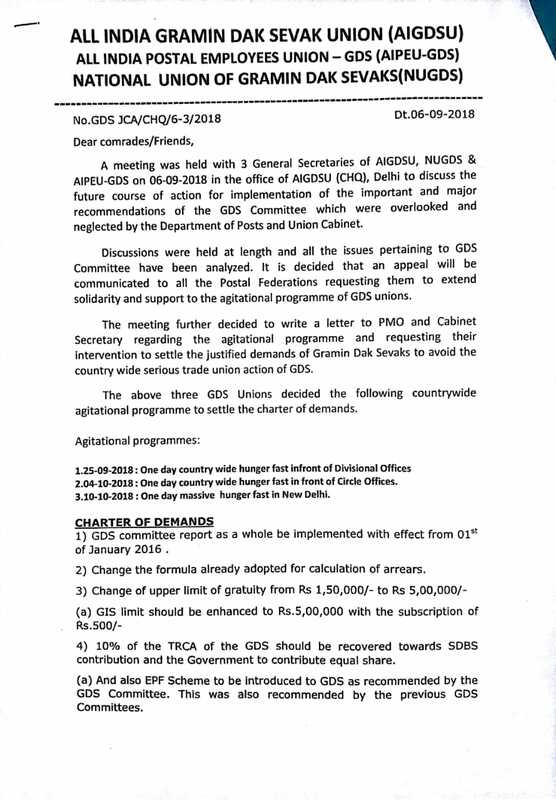 NUGDS Delegation met Dr.Sanjeeva Reddy,President INTUC on GDS issues at New Delhi. NUGDS delegation Consisting of Sri.P.U.Muraleedharan GS , Sri.Ch.Laxmi Narayana President CHQ, Sri.K.Venkata Ramana Dep.CS TS Circle and Sri.Ch.Koteswara Rao Circle Treasurer TS Circle met Dr.Sanjeeva Reddy President INTUC at Sramik Kendra INTUC Head Quarters ,New Delhi on 06.09.2018.Delegation explained the present situation of GDS in detail particularly non implementation of positive recommendations of Kamalesh Chandra Committee and removal of Rule 3A(i) and requested his intervention for justice to GDS. 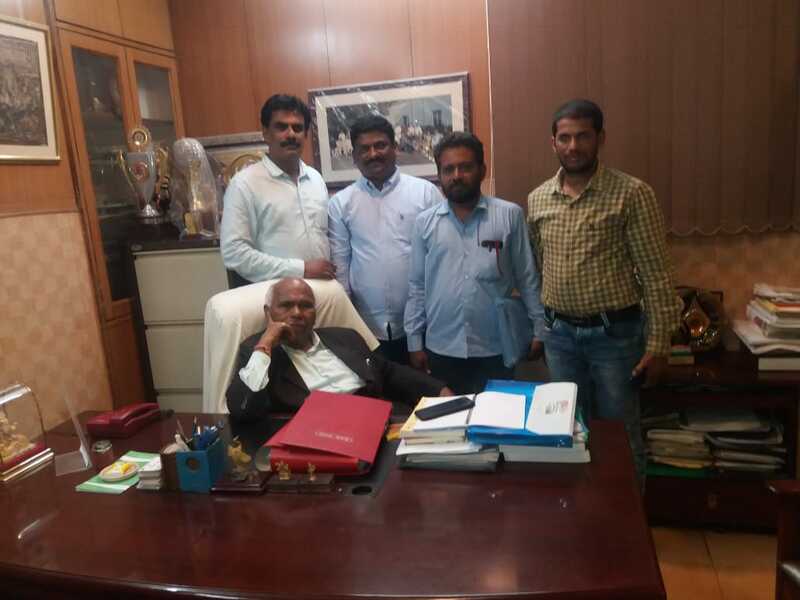 Delegation again met Dr.Sanjeeva Reddy today at INTUC New Delhi office and discussed regarding the GDS issues and submitted a detailed memorandum. 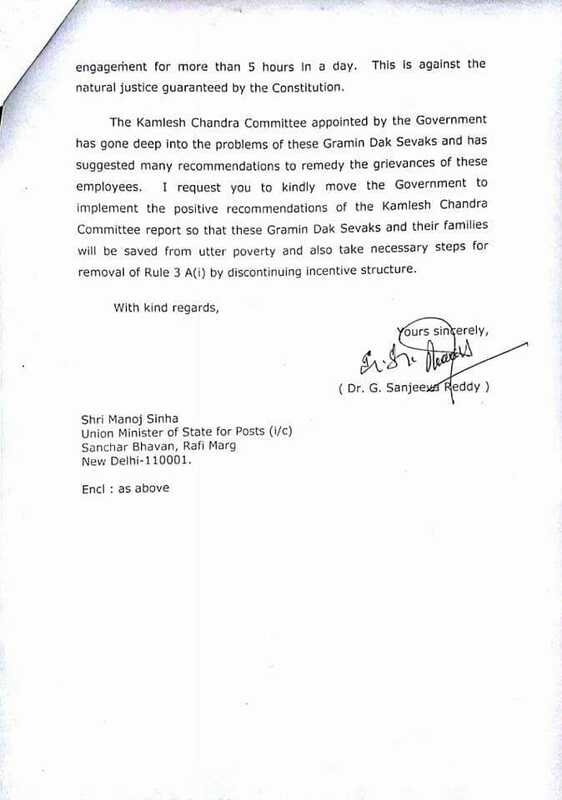 President INTUC immediately responded and wrote a letter to Sri.Manoj Sinha Hon'ble MoC and a copy forwarded to Secretary,Department of Posts for immediate implementation of positive recommendations of Kamalesh Chandra Committee and also take necessary steps for removal of Rule 3 A(i) of GDS Conduct&Engagement Rules,2011. 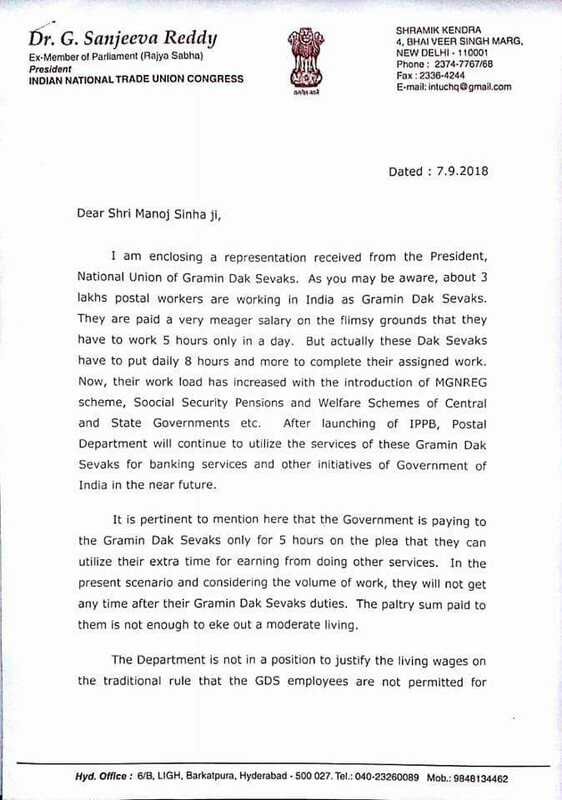 Delegation also requested Hon'ble President INTUC to include the GDS issue in the National Convention Demands which will be held on 28 th of this month.He assured the delegation that he will look after the matter at an earliest. 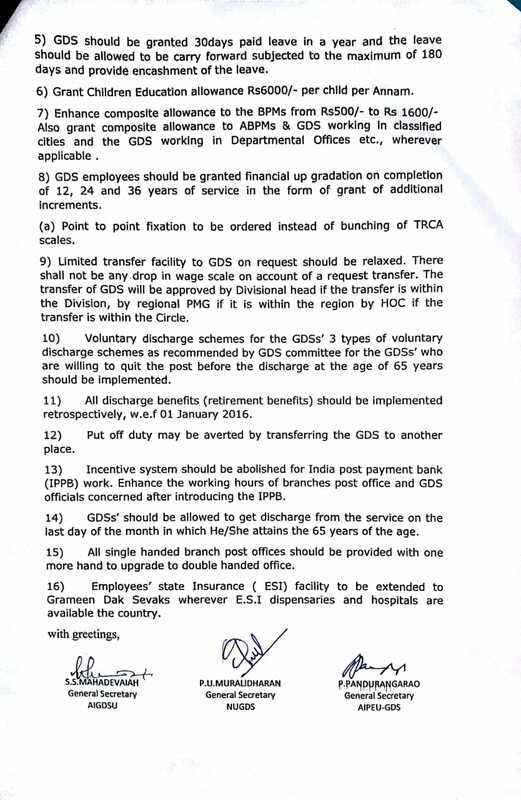 National Unions committed and assured the GDS cadre for early removal of Rule 3A(i) of GDS Conduct & Engagement Rules,2011. President,INTUC letters to Moc & Secretary Department of Posts are submitted below. Out Come of the GDS JCA Meeting held on 06.09.2018 at New Delhi.